Scenic villages across Europe have struggled for decades to keep their population numbers up, and until small industries return it’s tourism that will keep them occupied. The road to Saint-Cirq-Lapopie is as meandering and bucolic as the river Lot, above which the medieval village perches. On a summer day, it winds past rows of sunflowers, their upturned heads swaying hypnotically in the light breeze, past neat regiments of maize and uphill along the narrow route with its galleries hewn from the rock. The town of Saint Cirq Lapopie, France. Photo by LaurPhil. In the Middle Ages, it saw off warring seigneurs, religious fanatics and the English with its formidable defences. Today, however, Saint-Cirq-Lapopie has a new battle to wage. Since it was crowned France’s favourite village in a vote of television viewers in June, the hamlet of only 217 inhabitants, 30km east of Cahors, has been besieged by tourists. 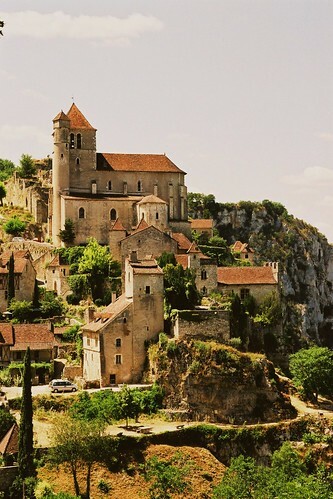 Even before TV stardom beckoned, Saint-Cirq-Lapopie was on the “must-see” map, with about 400,000 visitors every summer, the vast majority of them French. Now the locals are braced for hundreds of thousands more. The remains of the ancient gates at either end of the village, named after the child martyr Saint Cyr, and La Popie, one of the feudal dynasties that ruled in the Middle Ages, stop nobody these days. Closed, they had rendered the village almost impenetrable, as Richard the Lionheart discovered when he laid siege to Saint-Cirq without success in 1199. During the hundred years war in the 14th and 15th centuries, the village changed hands often, leading to one hidden entrance being named La Porte des Anglais. Later still, the village was on the frontline of the 16th-century French religious wars between Protestant Huguenots and Roman Catholics. After the second world war it became a haven for French surrealists when André Breton, the movement’s founder, bought a house here and established the village as a haven for artists. Breton wrote in 1951: “Saint-Cirq-Lapopie has cast a single enchantment over me. One that has fixed me for ever. I no longer wish to be anywhere else.” Today, Saint-Cirq still has its art galleries and its old magic. The imposing gothic church with its panoramic view far over the Lot Valley is flanked by the ruins of several ancient chateaux that lord it over a village packed with history, including 13 classified buildings. Peering down, the clusters of stone houses with their arrow-sharp, flat-tiled roofs cling to the rock and each other. Some are built on passages so steep their roof ends where their neighbour’s garden begins. There is surprisingly little 21st-century urban clutter: electricity cables and telephone wires have been hidden under the eaves and cobbles, television antennae banished to lofts; there are no satellite dishes, advertising hoardings or neon lights. The cars, coaches and caravans winding their way to the rocky escarpment are diverted to one of six car parks a short walk – or shuttle ride – away. Last week, the small tourist office that is modern-day Saint-Cirq’s first line of defence was under siege. “The sudden increase in visitors has taken us a bit by surprise … not that I’m complaining,” said Clare, who broke off from photocopying her last remaining village map to ring medics on behalf of a tourist who had sprained an ankle on the climb over stones polished by centuries of feet. Patrick Vinel, 56, is the fifth generation of his family to live and work in the village. A “Saint-Cirqouis de souche [born and bred]”, as they say. He is also the village’s last remaining woodturner. Once there were more than 100 engaged in the production of wooden taps for wine barrels. Today, Vinel produces gifts, toys and souvenirs. “Why would I complain? I live thanks to the tourists. I’m not going to spit in the soup by moaning,” Vinel said, sitting in his workshop near an old belt-and-pedal lathe. Swedish born Kristina Jacobsson, 48, vice-president of the Friends of Saint-Cirq-Lapopie, who runs the Lou Bolat restaurant, said she understood villagers who said enough was enough, but admitted she was “delighted” by the legions of tourists.